Scale Auto staffers Mark Savage and Robby DeGriff from Scale Auto were at the NNL Nationals in Sylvania, Ohio, busy with a professional studio setup and equipment, and working the tables to identify the most interesting models from this event for your viewing pleasure. They will be posting professionally photographed images with proper lighting and backgrounds from the event over the next few days. (You can even see a few of their pictures on the Scale Auto Facebook page now). And of course, they will do coverage in the magazine and the next Contest Annual. Meanwhile, you can look at this photo album to see a wide range of my table photography showing the overall flavor of the 2018 NNL Nationals, along with the name of each model's builder. The NNL Nationals is no longer the largest non-competitive model car event, but it is the oldest (this was the 39th annual event) and, some would say, the most influential. It was announced at the show that next year's event - NNL Nationalsl #40 - will be the last ever NNL Nationals. So, make plans now to "be there, or be square". And watch for full coverage of NNL Nationals #39 with studio quality photography from the Scale Auto team in the days, weeks, and months to come. 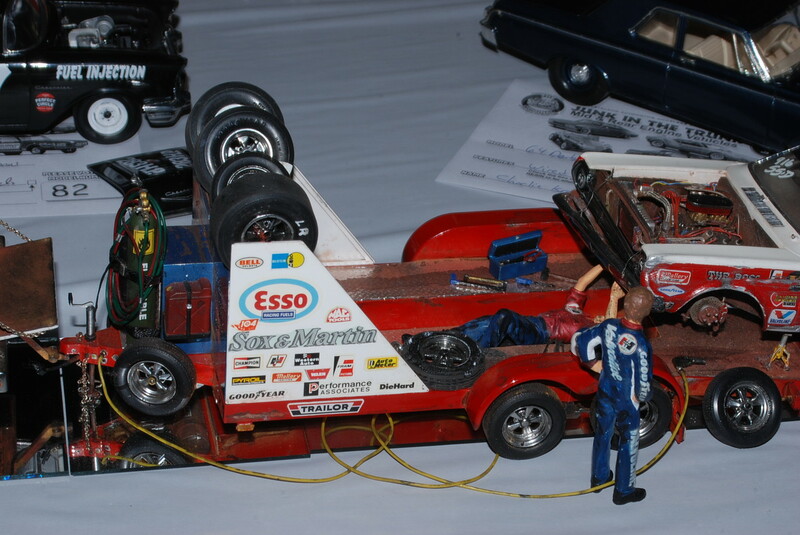 (One of the most impressive model displays this year came from Chris Gaster, who put together a three-piece "Sox and Martin" display with a Dodge W-100 4x4 tow vehicle, this trailer, and a 1967 GTX drag car undergoing maintanance between the rounds. More pictures of this display at the link above). Thanks for taking and posting your pictures Tim. I'm sure taking almost 300 pictures is quite a task. Above and beyond is becoming your normal, Tim! Your great photos show the variety of subjects and the passion of the builders for all to enjoy! I think the engine compartment detail on the Charger really rang my bell! Thanks once again for taking the time to photograph and share these works of art with all of us!